"Wearily the four came to rest in a deep lush valley known to then as Birdsonia. 'This is a quiet place, too quiet!' Rochee, of course, was more concerned than the other three, as he had been this way on a previous adventure. Suddenly from behind a rock jumped the strangest creature they had ever seen. 'Who are they that come my way? ', inquired the stranger. 'We are Rochee And The Sarnos from the land of beyond', said Rochee with a quiver in his voice - 'Who are you?' 'I am Eddinnius', said the peculiar half-man, half-ginger biscuit, 'the Guardian of the Hot Rod'. The Hot Rod. Now at last their quest was reaching its conclusion. Many, many tales had been told of this unusual contraption. Legend has it that it was handcarved by the hobgoblins of Oonaghia in the caves of Agom over three thousand generations ago........"
The original line up consisted of Lord Herbert III (v/g), the Phantom on Tea Chest Bass, and Budwin on Bongos. Rob Glazebrook, a well known and highly talented Rockabilly guitarist saw the potential and asked Lord Herbert if he would like to rehearse some new material that he had been working on. 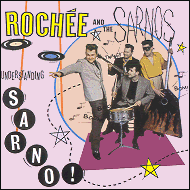 The very first session produced Sarno Fever and Sarno Dictionary, and a new sound was born. Budwin soon left and was replaced by the Man With No Brain on drums. Fans of Nervous Norvus, John Zacherle and The Legendary Stardust Cowboy - you came to the right place!